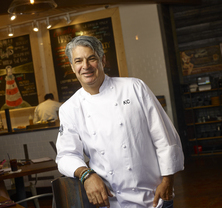 After stints at Mark Militello's Mark's City Place in West Palm Beach and Mark's at the Park in Boca Raton, Fiorelli headed west to open the late chef Kerry Simon's Simon LA in 2006 as the restaurant’s chef de cuisine. 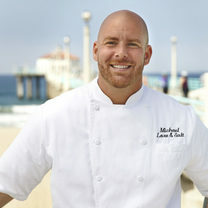 The experience paved the way for Fiorelli's next defining moment as the chef de cuisine at Terranea Resort's signature restaurant, mar'sel, where he would subsequently earn the accolade, "rising star chef" by Restaurants & Institutions Magazine, and garner critical acclaim for his still renowned "downlow burger” — now a favorite on the menu at Love & Salt. 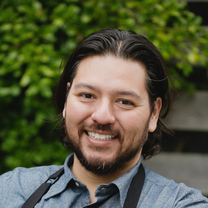 In 2012, Fiorelli was promoted to executive sous chef for all 11 food & beverage outlets at the Rancho Palos Verdes destination, a position he held until he left the property to partner with Guy & Sylvie Gabriele for the opening of Love & Salt in November 2014. "Old habits die hard. maeria"
"I stand next to these warm stuff donuts every night @loveandsaltla and try not to eat one. Failed again. At least I'm consistent. #bomboloni"
"Off menu tonight @loveandsaltla Corzetti pasta with zucchini, corn and parmesan. #veggielove"
"@puro_jaliciense_ Is gettin all up in our grill tonight with these lamb chops and preserved lemon salsa verde. loveandsaltla"
"The legendary “down low” burger @#tbl31sorrynotsorry"